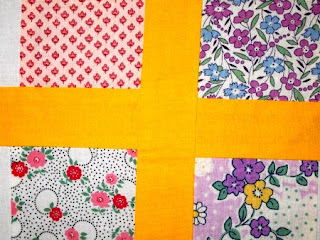 52 Quilts in 52 Weeks: A last-minute Friday Finish! 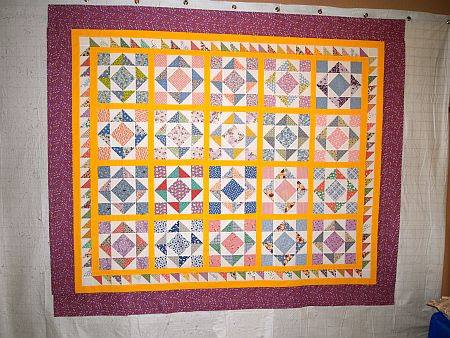 This is "Country Sunshine" from the 2002 edition of Better Homes & Gardens "Quilting Ideas" magazine. The designer is Rhoda Nelson. It's cloudy and about to storm in Colorado, so I had to take the photo inside. 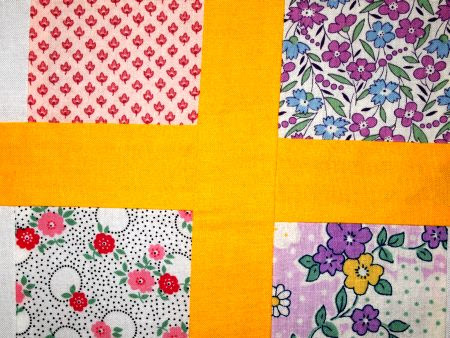 The border is actually a pretty lavender and yellow 30s reproduction print. I need to do a tutorial on lining up sashing pieces, see? I know how to do that, I just was in a hurry and didn't think of it until I hung the quilt on the design wall and saw that my borders don't line up in this one block! Remember, only two more days to submit your entry for the June UFO Parade. Email me a photo at AuntMarti at 52Quilts dot com! Darn that! But if its only one block you have done exceedingly well. And we wouldn't have noticed it in the photo. So cheerful and bright. I gave up on the straight corners and have had so much fun since. I love the Gee's Bend Women and how they paved the way for creative but not compulsive. I love that you finished a pattern called Country Sunshine in time for a storm! One slightly off border is no problem in my opinion! No worries about that block -- you can't even see it in the overall photo. Great job, Aunt Marti!